Solaire is a 400 acre project located in the City of Roseville. Westpark acquired this property in August 2010. 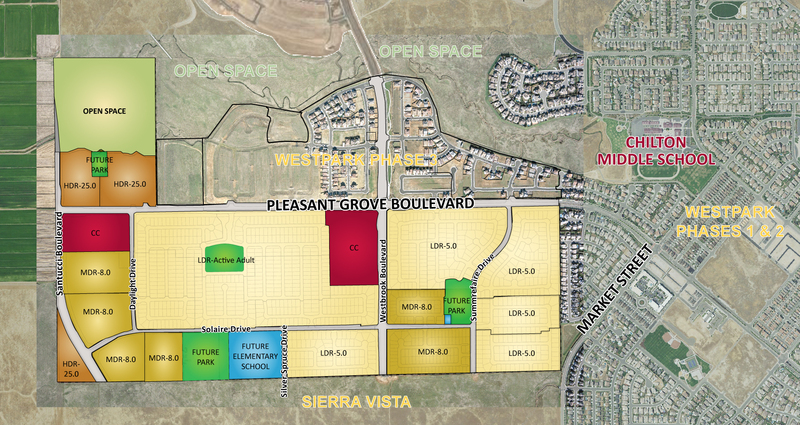 In 2011 Westpark requested a General Plan Amendment, Specific Plan Amendment, Development Agreement and Large Lot Tentative Map to create 2,029 residential units (1,340 single family lots and 689 multi family units), 43 acres of retail commercial, 15.5 acres of park land, 10 acres for an elementary school, and 37 acres of open space. These entitlements were approved in June 2012. The small lot tentative map for Solaire Phase 1 was approved in March 2014 and includes 547 single-family lots. The 404 permit for Solaire was issued in July 2014. Westpark installed backbone infrastructure for Phase 1 in 2015 and Woodside Homes began building homes in the first two villages. In 2015 a portion of the land plan was revised to incorporate a 493 unit active adult community. In 2016 Woodside Homes and DR Horton acquired villages in Phase 1. In 2017 Woodside Homes, DR Horton and Taylor Morrison acquired villages in Phase 1. Click Here to View the Community. Solaire is currently under construction. Solaire is currently marketing lots to builders.